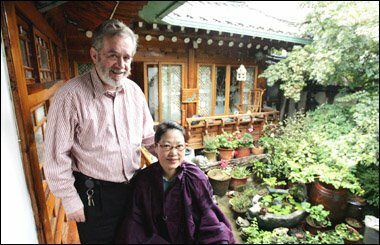 In Seoul, David Kilburn, owner of a traditional hanok house in the district of Kahoi-dong, is fighting against government policies and land speculators that have converged to threaten the district that has the feel of Seoul of 100 years ago. Recently, this battle became personal, as he was pushed by an architect/site manager, and hurt his back so bad he had to enter hospital. "The more we investigated the situation to save our own home, the more we realized that the whole district is in danger because of government policies and land speculators," he said to the Korea Times. By providing low interest loans for people who want to rebuild their hanok, the government is encouraging the destruction of the traditional houses, he argued. "The owners of one house were given a government grant of 30 million won and an interest-free long term loan of 20 million won for 'hanok repair and redecoration,’" Kilburn said. "They used this money to demolish a fine hanok and erect a modern two-story building which has also been licensed to operate as a wine bar." MBC, the Korean TV channel known for its great investigative reporting, did a program last year about David and his hanok battle, that is really worth watching, even if you don't understand Korean!